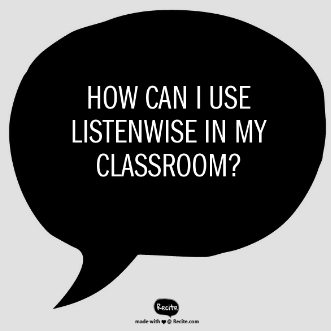 How Do Teachers Use Listenwise? This is a question we get a lot. “How can I use Listenwise in my classroom?” Well, here are some real stories that show how ELL, social studies, and ELA teachers incorporate Listenwise into their teaching pedagogy. Try out these ideas for incorporating listening with your students! Here are a few ideas from our Listenwise Teachers. And check out our Teacher Support site for more teaching resources for using Listenwise in your classroom. Why: Listenwise helps my students share their thinking and increase their interaction with the content. How: I flip my classroom and use Listenwise along with Google Classroom and other apps. I have students listen to a story and then participate in an online discussion about their opinion of the issue or what they learned. Why: I use audio stories to develop students’ listening and speaking strategies and skills. I adapt the reading/language arts curriculum for ESOL students, and visuals and audio helps them understand the content. How: I use Listenwise as a whole class activity. I link my warm-up to the Listenwise audio story to have students generate thoughts on the topic. Then I ask questions to determine their background knowledge. Lost Boys of Sudan– I used this story when we were talking about identity and how the past can affect the future. This is a good story for teachers who want their students to get a sense of what it is like to be an immigrant, to be uprooted and move to another country and then to have the courage to go back and help those you have left behind. Protests in Baltimore– I used this story after reading To Kill a Mockingbird. Why: I use these audio stories to introduce new content. How: I had students research a topic related to the 1930’s, such as The Stock Market Crash, Dust Bowl, Prohibition, etc. I chose two stories from Listenwise and we listened to one together as a whole class and I stopped the audio to add my commentary. Then I assigned the other story and students discussed with a partner to find the similarities between them. Then I called on certain students to share what they had discussed and we talked about it as a whole class. Why: I use Listenwise with my English Learners because the stories are short and fit into my curriculum. How: First we listen while I project the interactive transcript, and then we listen again and they check off the phrases as they hear them using the Language Identification checklist. Students retell the story to each other using target vocabulary and I make sure they are understanding the content. Recommended Story: Does Lack of Sleep Keep People Poor? Why: These stories really added a useful edge to my lessons that I can adapt as needed. I’m really excited about it! How: I have students listen to the stories twice, as they do in the Smarter Balanced Assessment, and then answer the provided comprehension questions and summarize what they heard. Recommended Story: Why Run for President? Why: These stories help my students see their own challenges in a new light. How: I provided visuals to help student comprehension, showed a video from the lesson and then they listened to the slowed audio version of the story. My students discussed the cultural differences in the story and how the past affects the future. Why: These stories have relevant content for social studies teachers. I like the current events, the mix of comprehension and opinion questions, and having an easy way to review assignments and check for comprehension. How: I assign 4 current events from the week. Students get to choose one to listen to and then they complete the questions. How about elementary kids. I see topics that aren’t age appropriate for them. Our content is most appropriate for starting around 4th or 5th grade and up, since this is public radio content that has been produced for adults in mind. We’ve added language challenge levels for each story so that you can search by a low, medium, or high language challenge level to help find age appropriate content for the grade levels you are teaching. If you are using these stories with elementary school, you could search the lesson collection for low language challenge stories to find stories with less complex vocabulary, sentence structure and language. Hope that helps!